Twenty-five of the 94 Track the Vote program participants were selected for interviews, as well as two additional agencies that participated in similar voter engagement programs managed by Nonprofit VOTE partners. 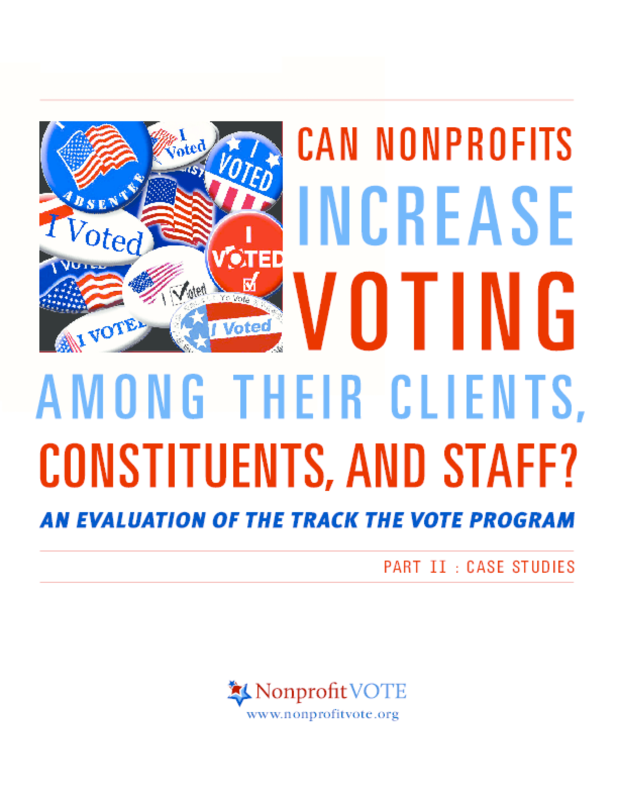 Fifteen of those interviews became the basis for the following case studies, designed to illustrate how a diverse group of nonprofit organizations conducted voter engagement in 2012. Each case study includes descriptions of voter outreach activities, challenges that arose, and concrete takeaways from their experiences. These case studies are intended to reflect the unique experiences of each nonprofit profiled. Thus, some of the "lessons learned" may be more relevant to particular nonprofi ts than to others, as successful tactics may vary widely depending on the type of organization and community served. These case studies are not meant to present a set of rules, but to provide a richer context for nonprof t voter engagement, inspiration for developing or refi ning your own voter engagement plan, and guidance for avoiding common pitfalls. By considering the detailed experiences of these many organizations, we hope that any nonprofit can assemble a voter engagement plan tailored to its programs, population, and capacity. We conclude with a case study from the Minnesota Participation Project, which managed the Track the Vote program in their state. Given the critical role that partner organizations played in supporting participating agencies, we wanted to share their experiences. Moreover, the perspective of a larger organization and how it supported voter engagement among its affiliates can help guide other groups looking to encourage efforts within their networks.